1) Voyager Pro HD – Experience brilliant, HD streaming audio plus natural, clear calls. Ergonomic all-day fit, streams music with the A2DP. Pauses streaming audio for calls or when the headset is taken off. Voice alerts announce talk time, volume, connection and more. Eliminates accidental dialing by locking call button when headset is not worn. 2) Voyager Pro+ – Dual-mic AudioIQ2 noise-canceling technology enriches voice quality. Boom places mic where it will capture your voice best. WindSmart technology blocks intrusive wind noise while driving down the road. Multipoint technology pairs one headset to two phones. Freedom to roam up to 33 feet (10 meters). Six hours of talk time / 5 days of standby time. 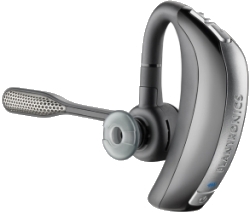 3) Voyager Pro B230 – Smart Sensors detect whether or not you are actually wearing the headset; the sensors are located in the ear loop and the speaker. The Smart Sensor technology works the same way as the touch (capacitor) sensors in devices like the iPad / iPhone touch screens. When the headset is brought close to the ear (like a finger near a touch screen), the sensor detects the conductive skin and the sensors communicate this change in state to the headset processor. With this comes a computer dongle that can be used with your laptop on the go. 4) Explorer 395 – To be hands free while driving is what we all need to achieve. This Bluetooth is great for using while on the road. An ergonomically-designed swivel earloop and a contoured ear tip offer you a comfortable, stable fit. Spend less time hassling with your charger thanks to a long-lasting battery that provides up to 5 hours of talk time and 7 days stand by time. 5) BackBeat 216 – This has a discreet inline microphone for convenient calling and music control. Well-balanced high and mid range for a realistic sound experience. Noise-isolating ear buds that boost bass levels. Noise Isolation 16B Sensitivity 110 dBSPL/mW @ 100Hz. This comes with a 3.5 adapter that can be used with smart phones, I Pads, and IPods. 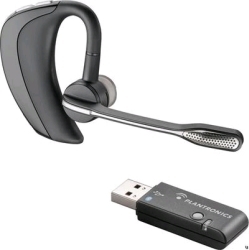 If you’re deciding between Bluetooth & Corded mobile headset models, it never hurts to see what the best 5 Bluetooth/Mobile headsets from Plantronics are, because chances are other customers have purchased headsets and found what they liked and continue to purchase them. Bluetooth headsets make talking on your mobile phone easier and more productive with your hands free to write or type.